Tags: blind hiker, challenges, Hiking, Inspiration, Kilimanjaro, Motivation, outdoors, Randy, success. Our African Expedition to Kilimanjaro, the Serengeti and Ngorongoro Crater was an absolutely amazing experience. While it is not reasonable to chronicle it entirely in a single blog, Tracy and I thought we’d share a couple of insider questions to each other to help you understand just a little of the experience. 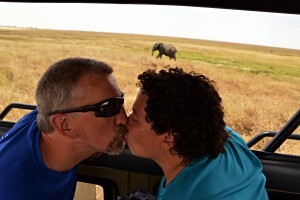 Randy and Tracy share a kiss on the Serengeti. 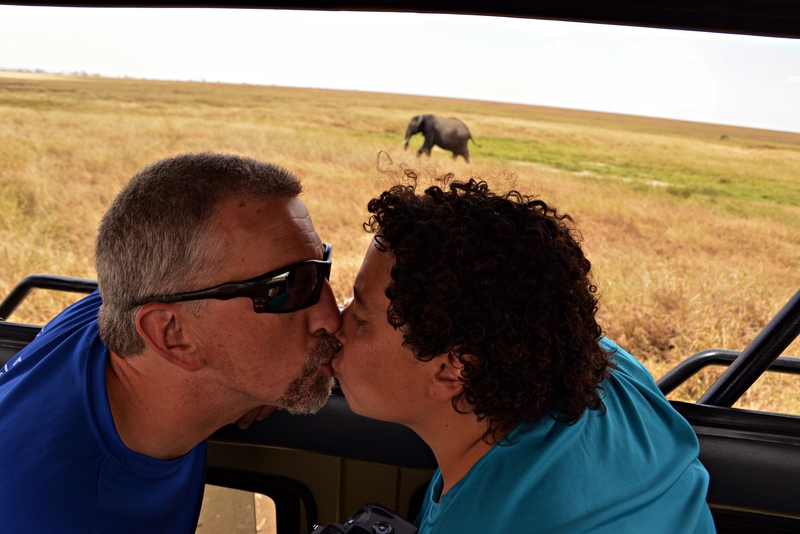 Randy: While the elephant looming behind our kiss is eye-catching, there’s another elephant in the room in that we did not summit together. Would you be willing to share a bit about that? Tracy: Oh, dive right into the tough questions! So I did not reach the summit, which was a very tough choice for me. I spent much of the trip plagued by headaches and shortness of breath. These symptoms caused me to progress far slower than the rest group so I requested a head start on summit night. About three hours into the hike (2am) the rest of the group caught up and easily passed us. By 4am (5 hours in) I was feeling extremely dizzy and was starting to stumble, after about 45 minutes of this I began to question whether I should continue. My teammate Maureen and guide Goodlove encouraged me to keep trying. I pushed on, hoping that sunrise would reinvigorate me. Sunrise came (amazing, gorgeous) but I had no rejuvenation. Finally at 7 am, after 8 hours of climbing I decided that if I kept pushing I would not be able to make it back down. I felt that I made a smart decision that was right for me and was proud that I persevered for hours and came within 10 minutes of Stella Point (5685 meters). In hindsight I wrestle with feelings of being left out of the experience that the rest of the team shared, yet, I also learned that I reached high enough in my climb to have technically reached Stella Point and I am mighty proud to have climbed so high. Tracy: Day two was some of the toughest footing we experienced can you share some thoughts on how you felt at the end of the day? Randy: Day one had particularly easy footing with water bars being the main challenge so in contrast day 2 was a little bit of a wake-up call. It still wasn’t any different than most of the trails in the White Mountains upon which we train. As we were climbing over 10,000 feet there was a constant barrage of incredible views and that gave us pause for photographs and side explorations commonly. As we neared the end of the uphill climb which was handled in the entirety by a strong and motivated Jose, we hit a few interesting side scrambles with a drop off. This required us to be slow to manage the risks of the falls which might have otherwise been a problem. Ultimately it was not the most tricky footing for me on the trip but in comparison to day 1 it was a slow down reality check on our pace even before altitude really reduced our speed. Randy: Do you have a particularly powerful moment from the Kilimanjaro hike which you might also like to share? Tracy: I think there were two experiences that I’d share. The first was on day two which is arguably the hardest 2.8 mile route I have ever hiked. I was hiking ahead of you and Jose which provided frequent occasions where I would be worried about how the two of you would navigate extremely tough footing. I occasionally stopped long enough for the two of your to catch up so I would know that you were well. The combination of fear and pride at what the two of you accomplished together will be with me until I die. Such powerful emotions do not fade easily. The second powerful moment was on the Barranco wall. We camped at the base of the 800′ Barranco wall on day three where it loomed imposing and scary. I woke feeling more than a touch apprehensive. Once we started on the wall I realized that the rock scrambling that we experienced in the Whites really set me up to tackle the wall strongly, although I was still scared of the notorious Kissing wall. We navigated a particularly tough spot and I mentioned out loud that if that one was so tough how hard would the Kissing wall be? That was when my guide told me that we had just done the Kissing wall. I felt so triumphant to have handily tackled something that I’d been so worried about. Tracy: As we know, summit day was extremely hard. You had some unexpected difficulties while trying to make the lower camp, will you share that story? Randy: Absolutely I’ll share what all those on the hike already understand all too well. Summit day was incredibly difficult in many ways. We’d had little, or in many cases no, sleep; we had too little nutrition as feelings of nausea hamper the ability to eat. We hiked in the dark which restricted my guides abilities and as the oxygen thinned it was harder on all of us to find ways to keep working. Seven hours of hiking brought us to the summit with nobody feeling well or strong. Still things were good enough to savor the sunrise and the summit before we began the long descent. Down is almost always harder on me though the skree of the upper levels wasn’t too bad. Few guides had much strength to guide long and Jose and Rob had spent much of their efforts in getting me to the summit. Greg Neault really stepped in at a critical time. Unfortunately the last half mile before Barafu (high camp) was truly the most difficult for my feet and we worked incredibly hard to get through it. With my headache pounding at impressive levels, food reserves non-existant it would have been great to get a refreshing break at Barafu. Unfortunately plans called for us to rest briefly, get lunch and then hike six difficult trail miles back to a more reasonable elevation at Mweka camp. I was unable to sleep or eat and while Greg put in two of the miles guiding, we switched to Jose with me feeling more and more nauseated, light headed and struggling to give the focus I need to walk even a moderate trail. Two full days of no sleep along with the mental and physical exertion caught up with me and I lost consciousness for a moment, collapsing behind Jose. Once again a strength of the entire experience was the incredible dedication and capability of the Climb Killi guides and porters. Our main guide, Emmanuel, and one of the assistants, Vader, walked beside me with our arms wrapped around each other’s shoulders for steady support. The trail became a washed out stream bed which is amongst the worst for my making time. We plodded on slowly and with little progress towards my recovery until we neared 12,000 feet. Finally the nausea lifted enough for me to hold down a couple of Jenn’s sports drinks and keep me conscious through to the final camp. I collapsed into the tent and slept through until morning with again no dinner. While this concerned the guides, Tracy and the team understood I could eat a hearty breakfast but sleep was my essential need. This allowed full rejuvenation and a strong hike out on our final day which was blessedly back on trail which is more easily managed. I’m certainly not proud of how rough it was for me but I’m thankful for how much the team supported the efforts necessary to let me struggle through ultimately enough. A very special thanks to Michelle for the constant medical care along the way and to you, Tracy, for having our tent so well ready for my essential collapse. Randy: My next question involves our team. As I was so commonly connected to a primary guide and each of us formed our own interactions, I wonder what you took away from the development of our team? Tracy: That is an great question. I knew every member of the team to varying degrees prior to our trip, with the exception of Maureen. A wonderful development was that Maureen was by far my biggest, most pleasant surprise. We found that we hike at similar paces and have similar hiking styles and really got along famously. As to the rest of the team, I loved how quickly the entire team settled into a fun camaraderie coupled with kindness and helpfulness. It is true that sharing epic adventures with a group of people creates a bond that is both amazing and unrivaled. I will cherish this group of people for their sense of fun, adventure and their willingness to help their fellow teammates! Tracy: One of my favorite, most celebratory moments was the singing that we were greeted with at the Mweka gate on our completion of the trip. Can you share a time that was most celebratory to you? Randy: You know I’m never shy so I’ll share two very different experiences which took place on the same day, I believe. On Wednesday night we camped at the Barranco Camp with the massive and intimidating 800 foot wall directly ahead of us. This was a hands to the trail slightly technical scramble for much of the morning. Our entire team has enough familiarity with scrambles in the white Mountains that we treated the entire journey like the East Osceola chimney. We were quick and capable such that at the top of the wall we stopped to celebrate together. It was a great bonding moment of achievement and pride for how well everyone had worked. I relished that feeling then and still. Later that evening we were in the mess tent sharing a dinner when Greg asked Rob to read his guest blog that had been released back home. It was powerful and moving on so many fronts and led to more team emotional sharing which brought us together on an even deeper level. We had plenty of trials ahead but the team was cemented into a strong and caring enough core to undertake that challenge together. Randy: The Serengeti was so vastly different from what I expected and definitely an incredible experience. What surprised you most about the Safari adventure? Tracy: The Serengeti was amazing and the one thing that surprised me the most was just how close most of the animals were. Whether it was hyenas or lions sleeping right off the road, or elephants passing behind our Landrover almost close enough to touch. While this is just the barest insight into the experiences of only two of our eleven team members, it hopefully provides you with a little flavor as well as the incentive to reach out to any and all of our team for the rest of the many stories. Life has the potential to be an amazing series of adventures whether by hearing or living the stories. As in many things, however, they are always the sweeter when shared together. Thank you Tracy for sharing life’s adventures with me! What an experience for all of you! Thank you for so honestly sharing your experiences and emotions. It would be easy for you to present only the highs, but there is so much more to the story, and learning how you handled the lows is enlightening and encouraging. Welcome home! Thank you both for being so open and discussing so much of what went on. Those of us who are unable to manage climbing can almost feel what it is from your narrations and the incredible pictures that have been posted. Again, thank you for letting us live vicariously through you.